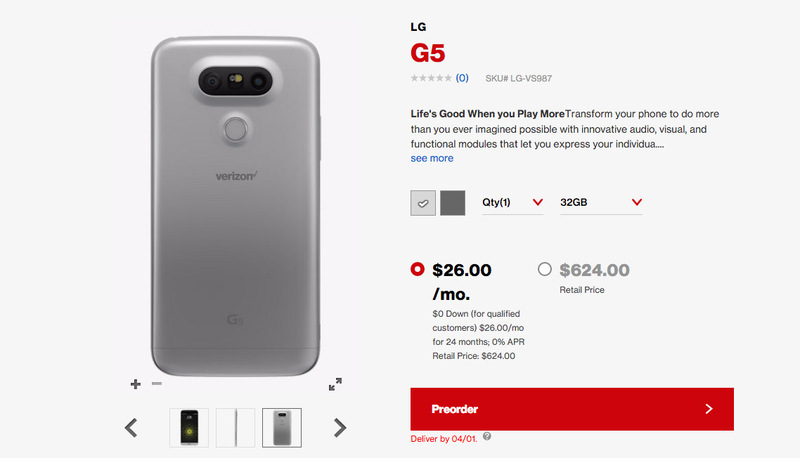 The LG G5 is now up for pre-order at Verizon starting at $26 per month for 24 months. You can buy it without a contract, as well, for $624. Verizon is selling the silver and titan versions, so no gold or pink, my friends. Verizon says that if you pre-order you will have your phone in time for the April 1 launch. But also, if you pre-order, Verizon is tossing in a free battery and charging cradle, along with a free 360 CAM, so you can be come the VR master of the G5.